My oldest started Kindergarten a couple of weeks ago. 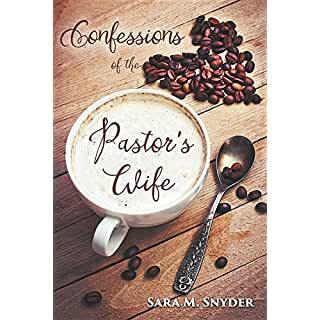 It's great, and he loves it, and we are slowly finding our rhythm in this new stage of life. But, like most transitions, it wasn't an easy one to make. Parent Night was especially difficult for me. So many emotions coursed through my body. Anger and bitterness emerged as I dealt with the fact that I am not working in the school which my son attends. I've had to let go of the picture in my head of us walking to and from school together, sharing our days with one another. And there were the tears which stung my eyes as I walked through his new classroom and watched him explore his new "home'. In sharing all of this with a friend, I received from her this encouraging word. 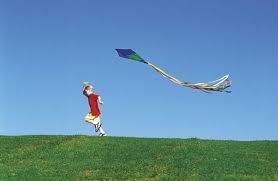 "Our children are like kites. We hold the string at the end of the kite, and when they are first born we keep the kite string very short and they are right by us. 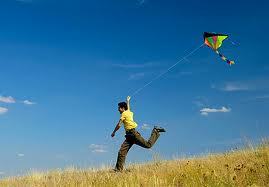 As they get older, we continue to let the kite string out, so they can grow in their independence. You are just letting your kite string out a little more with this step, but remember you are never letting go of the string that ties you to Garrett. Just think of the parents taking their kids to college. Whew! Their kite strings are really getting long, but no parent ever lets go of the end of the string." Remember, I am always with you until the end of time. Even so, there are times in this life when we feel as if we are being carried away by a strong wind. We feel as if we are a kite that has broken off from it's string, tossed and battered in the wind. It can be easy to forget that God is still there holding onto our string. Why doesn't he reel us in? Because, what would we learn if he did? How would we grow in our faith if God never let us ride on the wind? In Hebrews 6 the author speaks of the importance of Christians growing and maturing in their faith. We can't grow in our faith if God protects us from all the ups and downs of life. Time and again Scripture shows us that it is through the struggles of life that real faith emerges. It is in those times of trials that God is able to show us his mighty hand. And so, he lets us fly through both the gentle breezes and the raging storms of this human life. However, no matter how far we fly, God never lets go of the string. Through it all, he charts our course and leads us where he wants us to go. And so, as hard as it will be as my children grow and mature, I rest assured that there are stronger hands than mine holding their line!! My oldest starts Kindergarten on Tuesday and he can hardly wait. Thanks for the encouragement. Love the analogy, so true 🙂 starting out on the kindergarten adventure this year too. How cool! It's funny, I was so stressed about it before he went. And now, he's just doing great! Maybe someday I'll learn to set worrying aside.